Based on the considerations of my last few serial number-related posts, plus external confirmation on the timing of some engraving style changes, I’ve updated the primary serial number table for Reynolds instruments, as well as the dates on the Reynolds engraving styles page and specification pages for F.A. Reynolds trumpets, cornets and trombones. The key data point is that the change in engraving styles to the style shown at right on these instruments occurred in late 1945 or 1946, rather than c.1942 as previously projected. Based on documented horns, the change occurred around SN 9000. In addition to meaning that fewer horns were made in the first ten years than previously thought, the primary takeaway is that there was a rapid acceleration in the manufacturing rate after Scherl & Roth took over in 1946, going from SN 9000 to ~21000 in the spring of 1949 when the first Contempora instruments were made. The serial number on my trumpet is 8392, and it has the above engraving style. 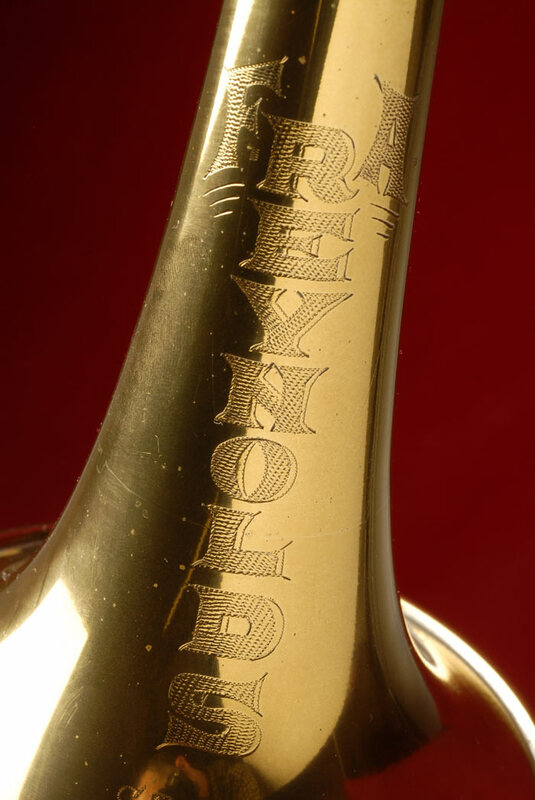 Do you have any records of trumpets with earlier serial numbers with this engraving style? Did this change in engraving style occur a little before Scherl and Roth took over? Hi I have a FA Reynolds Trumpet too. The serial number is 8130. It seems to have to older engraving style, but it’s so faded and tarnished. I used it during school, so it has definitely seen better days. I don’t think this is worth any real money. It’d be real neat to know more of the history to it. Is it possible that based off the serial number it’s from the 1940’s? Is it also possible that this was in World War 2? I own or have owned 24 trumpets including a mint Olds Studio, an Olds Recording, and a Besson French Classic, but my favorite trumpets are my Reynolds Pro models. I have one in excellent condition with a serial no. of slightly over 9000, and one in reasonable condition with a serial no. of slightly over 10000, and both have the “Reynolds” vertical design like pictured above. They both play beautifully, although the one in excellent condition is unbelievable. It has it all: exceptionally smooth piston movement with excellent pitch & beautiful sound always right on the spot, no hesitation, no misses. I can’t even imagine a trumpet playing better. I thought my 9000 & 10000 Reynolds were built around 1941 & 42, now you’re telling me different. I’m disappointed to learn that’s when Roth came into the fold, & since they manufactured more than before I would think the quality may have suffered a bit. So, if that is true, would the pre-1941 or pre-9000 Reynolds Pros play even better? and what was the engraving design like? Have you any pictures? I’d like to know any info about the Reynolds Pro: what was their best year for Quality, and how do they compare with the late 1940’s top of the line Contempora? I have a Reynolds cornet SN20412. How can I find out what I have? I have a Reynolds Contempora trumpet with the original case and sales receipt from Jan. 1970. It’s in very good condition. Do you have an idea of what the value may be? Does my silver coronet follow the same serial number list given for the “Tone-Tempered? Is my horn an Emporer Model? An Ohio Band trumpet with SN 12528 probably dates from c.1939, but there’s a fair degree of uncertainty due to lack of official records.